W Hotels Worldwide today announced the signing of W Bali - Ubud, the brand's newest W Escape. Developed in partnership with Indonesia's Ruang Teknik Group, W Bali - Ubud is set to bring W's bold design, signature Whatever/Whenever® service and innovative programming to the cultural heart of Bali. Perched on a hilltop, oriented toward the morning sun rising in the east, and southwards over stunning, unobstructed views of the Tanggayuda Valley, W Bali – Ubud will reinvent the dreamy Ubud experience with eclectic, surprising art and design set amongst a versatile vibe that is at once laid back and social. No matter what guests crave – from sunrise meditation on a mountaintop to late night dancing under the jungle stars, every holiday spent at W Bali – Ubud will be filled with unforgettable magic. 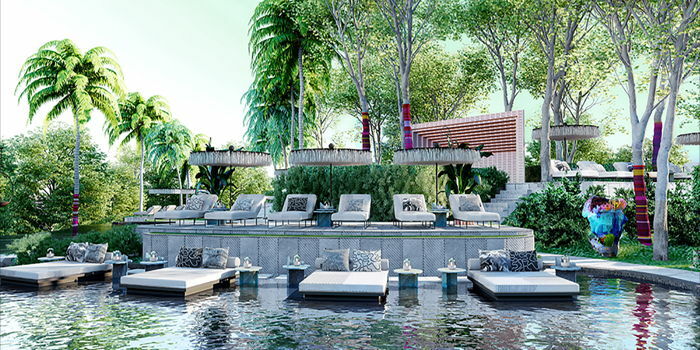 This expansion into Ubud marks the second W Hotel in Indonesia, following the opening of W Bali – Seminyak in 2010. "Ubud is a hidden destination like no other, where legends and nature intertwine with everyday life to create a magical sense of adventure," said Anthony Ingham, Global Brand Leader, W Hotels Worldwide. "W Bali – Ubud is an exciting next step for us. We are applying a unique, vibrant sensibility to this hotel, one that has not been seen before on the island. W Bali – Ubud will combine the brand's boundary-breaking approach to design with the rich cultural, spiritual and artistic influences of Ubud to show off the best of this incredible locale and all we've learned in the decade since W debuted in Indonesia." W Bali – Ubud will redefine modern luxury in the destination, taking inspiration from social, historical and physical insights and embedding elements of each into the rooms and public spaces. Upon entering the hotel, guests will be immersed in modern interpretations of traditional Balinese art styles with works from local artists, that lead to breath-taking lounges perfect for soaking in spectacular jungle sunsets as sounds of cool beats drift through the air. The hotel will offer 100 inspired guestrooms, including 10 villas with private swimming pools and an EWOW suite (the brand's take on the traditional Presidential Suite). As the brand's newest W Escape, W Bali – Ubud will bring a bold new take on international cuisine with a Balinese twist to multiple on-site bars and restaurants. Traditional Asian flavors intertwine with international influences at the stylish all-day dining restaurant Morinda, which will tempt guests with an in-house bakery, fresh-pressed juices, a strong vegan focus and a third-wave approach to coffee culture. Synn, a specialty restaurant featuring the finest of Balinese and world cuisines will be an underground sensation, literally. This new restaurant is partially underground, opening towards a jungle cliff and featuring cuisine as innovative as the locale including a progressive cocktail lab and digital artwork on display. Encouraging guests to detox and retox in true W style, the FIT (gym) bar will feature a pressed juice lab by day and a high-energy bar by night complete with UV-responsive, painted displays. Guests can indulge their wanderlust at Wanderbar, the hotel's panoramic cocktail bar nestled on one of the hotel's highest hills, offering 360-degree views from sunrise to sunset and inspired concoctions to match.